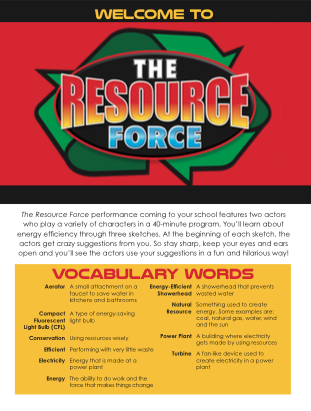 The Resource Force is a 40-minute play performed by two professional actors who engage middle school students through a series of improvisational comedy sketches, while teaching about resources and energy conservation and calling on your students to do their part to conserve energy. Taking suggestions from the audience, the actors allow the students to help create the show that they see, forming a unique program with each presentation. Within these sketches, the performers cover topics like renewable and non-renewable resources, how resources are used to create energy and electricity, the difference between energy conservation and energy efficiency, and practical things that everyone can do to save energy. Your students will laugh so hard they’ll forget they’re learning! 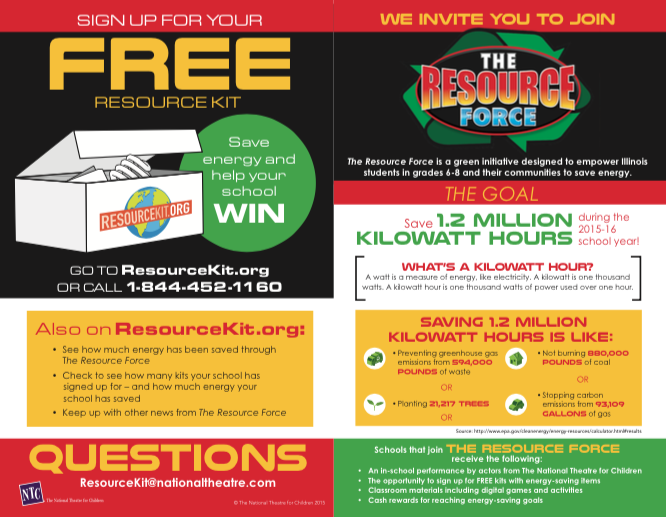 The Resource Force in-school performance is one component of The Resource Force initiative, designed to empower Illinois middle school students and their communities to save energy. This year, the goal is to save 1.2 million kilowatt hours. The Resource Force aligns with Next Generation Science Standards & Common Core English Language Arts Standards.